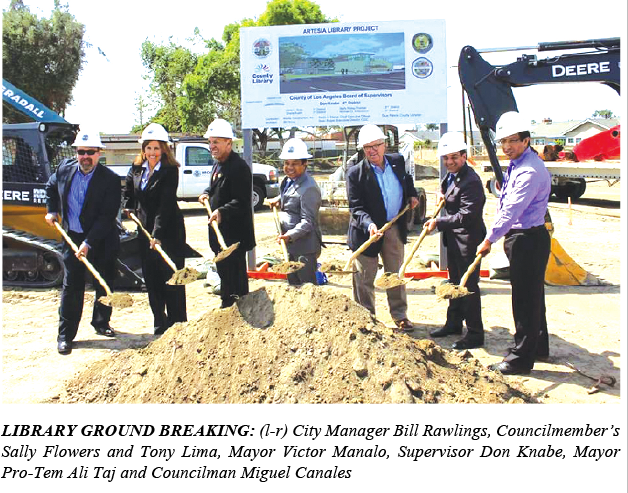 Los Angeles County Supervisor Don Knabe, Artesia City Council, and new Library Director Skye Patrick broke ground on the new Artesia Library the past Wednesday. When complete, the 10,850 square foot Artesia Library is expected to achieve top environmental sustainability standard with leadership in energy and environmental design certification. Artesia Library also will feature adult and children’s reading area, a teen area, homework center, two group study rooms, early childhood and family place programming area, a laptop vending machine, 12 public access computers, two early childhood computer learning stations, a Friends of the Library book sale room, a ‘new materials marketplace’, digital signage, express service self checkout stations and a 100 seat community meeting room with an audio-visual system and kitchenette. IBI Group is the architectural firm designing the new library and the Los Angeles county Community Development commission is handling the project management. Megan Ramos, 8th grader and Student Body President of Our Lady of Fatima School led the Pledge of Allegiance. The area where the library is being built was mainly used by gang members and pot heads. Thank God they got rid of all those ugly benches. Hopefully the city of Artesia will add more lighting and have more police presence. There are a lot of druggies in the parking lot areas.. I recently drove by this and was literally shocked. How dare the city for fathers, lose their precious Park property to a stupid Library when the city of Cerritos has a huge Library within a miles distance, and the Artesia library was sufficient. What happened to our forefathers dream of open space and Parks. ?